Malala has been the center of attraction both in negative and positive terms in Pakistan and beyond border. This week at the London Film Festival a documentary about the youngest-ever Nobel Peace laureate had its European premiere. "He named me Malala" is an intimate portrait of Malala Yousafzai, the passionate Pakistani advocate `of girls' education who survived a brutal Taliban gun attack in 2012. Even the festival's biggest stars seemed humbled by the teenager and her aspirations. American actress Meryl Streep hailed her as the worthy heiress of the suffragettes who battled for the right to vote in Britain in the early 20th century. Filmed over 18 months in Britain, Kenya, Nigeria, Abu Dhabi and Jordan, the documentary by American David Guggenheim recalls how Malala's father chose her name in honor of Malalai of Maiwand, a heroine who rallied the Pashtun army against British troops in 1880. 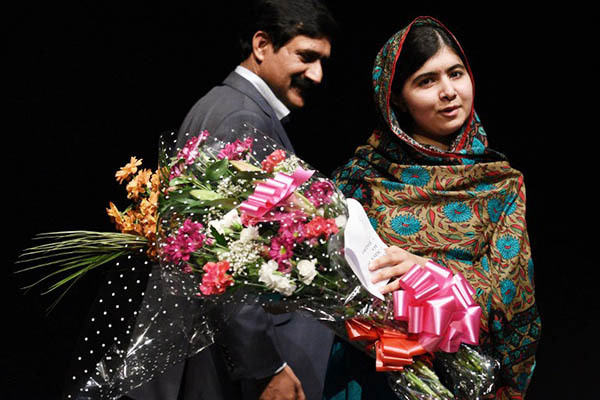 "When I was little, many people would say, 'Change Malala's name. It's a bad name, it means sad.' But my father would always say, 'No, it has another meaning. Bravery'," the 18-year-old said. On screen, the teenager is seen at her home in Birmingham, central England, explaining to her father in the family living room how Twitter works, or squabbling with her brothers, Atal and Khushal. The film follows her at school, in the streets of New York, at a refugee camp, spreading her optimistic and determined message on the right to education. "One child, one teacher, one book and one pen can change the world," she proclaimed. The documentary also shows her life in Pakistan's Swat valley where she decided, aged 11, to write a blog for the BBC -- "Diary of a Pakistani schoolgirl" -- in which she denounces Taliban violence. Guggenheim turns to animation to bring to life these years before the attempted assassination in October 2012, when Taliban gunmen opened fire on then 14-year-old Malala on her school bus. The film also shows the months of hospitalization and reeducation of the girl who wants to become Prime Minister of Pakistan, as well as her close relationship to her father, himself a teacher and staunch defender of the right to education. To silence the critics who see her as her father's mouthpiece, she added: "my father only gave me the name Malalai. He didn't make me Malalai. I chose this life." Her father, Ziauddin Yousafzai, meanwhile told of his astonishment at the Taliban attack, saying: "they had never killed a child, I never expected that". On occasions in the film, Malala is just a normal teenager: she looks at photos of Brad Pitt, speaks of her favorite book, "the Alchemist" by Paulo Coelho, and shares her passion for cricket. But she recognizes the difference between her and her British classmates who "all have boyfriends". And she shares her dreams of one day returning to the Swat valley. "He named me Malala" is released in Britain on November 6. Her name has been on everyone’s lips, somewhere in praise and somewhere for criticism. Even after bagging the Nobel Prize, many see her with hatred and tag her a western agent. The film is much awaited in all over the world and the pro Malala section of society wanted to view it.